I had the entire day before Dad and Brian arrived. I spent various parts of the day walking around, checking out the sights, getting some Internet related things done, and just decompressing in general. 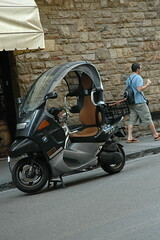 We’re staying at the Welcome to the Hotel San Giorgio & Olimpic in Florence, which is about here. Behind us is a giant outdoor street market lined with carts. 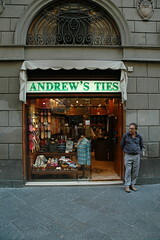 People mostly sell leather coats, belts, purses. Also tshirts and other memorabilia. 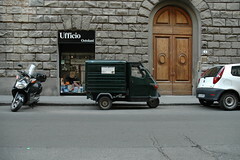 That street is actually pretty wide, even with all the carts in it. 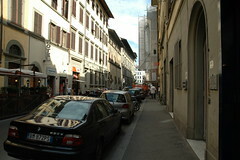 A lot of the side streets are small, especially when cars park on the street. 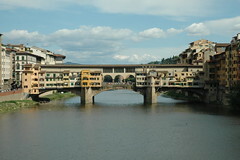 I made it all the way down to Ponte Vecchio, which literally means “Old Bridge” in Italian. 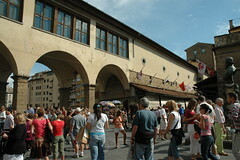 It spans the river Arno and is Europe’s oldest bridge. Amazingly, it wasn’t destroyed during WWII due to the express wishes of a German commander to preserve the bridge. So instead of destroying the bridge, they bombed the buildings on both sides of it to make it impassable. 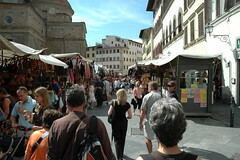 It is said that the economic concept of bankruptcy originated here: when a merchant could not pay his debts, the table on which he sold his wares (the “banco”) was physically broken (“rotto”) by soldiers, and this practice was called “bancorotto” (broken table; possibly it can come from “banca rotta” which means “broken bank”). Not having a table anymore, the merchant was not able to sell anything. 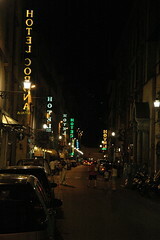 I walked around quite a bit this night, actually looking for an Internet cafe that was open. It’s amazing how busy things are even after the sun sets. 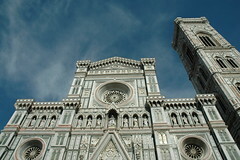 I was also amazed at how many hotels are in Florence.